“We didn’t know what we didn’t know” is Arathi Rajagopalan’s frank take on the early days of Across Borders. “We were a growing company with limited resources. That’s why we came to the [Florida SBDC at UCF] – there we found a wealth of knowledge and services tailor-made for a company like ours,” she stated. 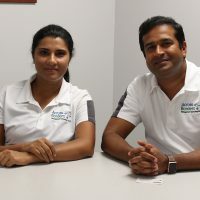 Both Vijay and Arathi Krishnan credit the Florida SBDC as helping shape the company that Across Borders is today. Initially they sought and received assistance regarding their sales and business development efforts. That was followed by an in-depth business and financial analysis as part of the Florida SBDC’s Growth Acceleration Services. With that as a starting point, Across Borders was able to develop their first three-year strategic plan. Meanwhile, the company and cofounders became part of the Florida SBDC at UCF’s Advisory Board Council program, a next-level, business-support service matching them with experienced business professionals with a diverse range of skills who volunteer and work together on a “custom-fit” advisory board. Further on, Vijay Krishnan joined the Florida SBDC at UCF’s CEO XChange, an executive roundtable program offering a confidential setting for top executives to discuss vital business issues, opportunities and trends with a group of peers. Most recently, Across Borders worked with the Florida SBDC’s International Trade Services team and gained a ready-to-implement Export Marketing Plan. "The FSBDC has become a critically important strategic partner for Across Borders. They have worked with us every step of the way. Their services are at the top-most professional level. And their only focus is on helping us grow to the next level. That is the best kind of partnership possible. We’re very happy and thankful for the FSBDC. "